Price: $22990 - Beautiful Stingray to show and drive! 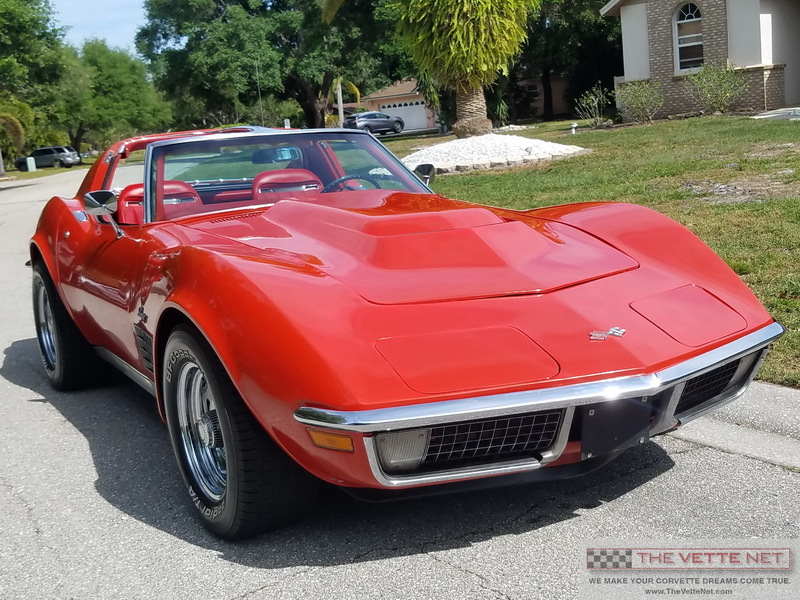 You know what they say: “All Corvettes are Red”… so is this one, donned in an older Red paint, still very shinny and with minimal signs of aging as seen the pictures, also new Chrome bumpers. Interior has newer seat covers, new carpet, door panels, all complete and in good shape. All gauges and instruments work (we did not see the clock moving, though…). Engine is the matching number 350/300 HP with the correct suffix “CTG” (350/300 auto) and VIN present on the engine pad. It is mated with the automatic transmission. Both work as they should. AC is fully functional and blows cold air. Vacuum system was freshened up and both headlights and wiper door systems work properly. Brakes are fresh and perform as they should. Undercarriage is clean and rubber parts appear to be recently replaced as seen in pics. It comes with an upgraded Big Block hood, but the original is available if needed, also the original Rally wheels. Car needs nothing, just a new enthusiast to give it a good home, to drive daily and show it on Sundays.